I remember the first time I tasted Creme Fraiche. It was my first trip to Paris…too many years ago to mention or else it will easily date me. First it was served alongside a berry tart in a cafe. Then later that week it was drizzled over a soup. The slightly sour, yet somehow slightly sweet creaminess was heaven and seemed equally at home with sweet or savory companions. “What is this magical cream that goes with things both sweet and savory,” I asked my waiter? “Madame, eet iz creme fraiche!” he said. Thus, began my love affair with creme fraiche. Upon coming to China I realize it is very difficult to find. And in fact I started to make it myself. Turns out it is super easy (and also impressive to dinner guests). Now, like with mayonnaise and dressings, I will never buy commercial creme fraiche again. The creme fraiche will keep for up to 7 days in the refrigerator after making. That’s it! Easy peasy. 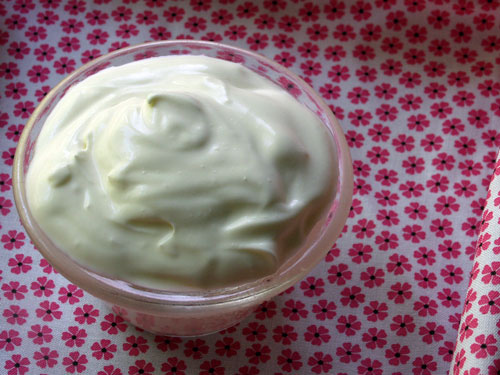 Homemade creme fraiche. Why bothering buying it? This is perfect!